Don’t let your wooden fence rot. Now that spring is here, you might feel the bite of the home improvement bug. No, not that bug (as in termites that like to eat your wooden fences!) Instead, we mean that you want to build a fence. But you also want to make sure that your fence won’t start rotting. Since spring is a rainy season, this can be a bit of a problem. Here are some helpful tips for you. Rot is ugly, but that isn’t the only reason to get rid of it. Enough rot can make the posts that hold your wooden fence degrade, and once it has worn away enough, your fence will tumble down to the wet ground. Most of the time, rot damage occurs at ground level, where the fence meets the soil. 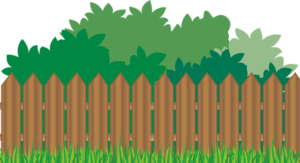 One side effect of fence post failure is called cascade failure, where one falling section of fence pulls its neighbors down with it. Strong windstorms can also destroy your fences, which is why it’s important to make sure that they are as resilient as possible. One way to do this is to simply keep the soil away from your wooden fence. This can be a tall task. Try using wood that resists the damaging effects of rot: some of our favorites include cedar, pressure-treated lumber, and redwood. However, this doesn’t mean that they are impervious to nature’s efforts to bring them down. Another method is to rethink where the posts should go. Start by digging a new hole using a post hole digger. Then line the bottom of the hole you just dug with some crushed rock. Then slide the post into the hole, on top of the rock. Turn away from your fence posts for a minute and mix some concrete in a wheelbarrow. Then fill the hole with the concrete. This will make sure that no voids or pockets of air form, which will also help keep your wooden fences upright far longer than if you didn’t do it this way. This entry was posted on Friday, April 5th, 2019 at 5:13 pm. Both comments and pings are currently closed.